Drowning of Leonard Pluvier, Jannetje, and Marietje van Aken, Antwerp, 1560. Engraving by Jan Luiken in Martyrs' Mirror, v. 2, p. 271 of Dutch edition. 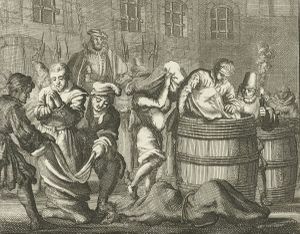 Maeyken de Hont (Hondt), an Anabaptist martyr, drowned in a tub or wine-cask on 3 April 1560 within the Steen castle at Antwerp, Belgium, with Janneken Eghels (Janneken van Aken) and Lenaert Plovier. She was a daughter of Jan de Hont. In the Dutch martyrbooks, where no exact date of the execution is given, she is called Maeyken (Mayken) van Aken. Her name is found in the hymn "Aenhoort, Godt, hemelsche Vader" (Hear, O God, heavenly Father) of the Lietboecxken van den Offer des Heeren (hymn No. 16). Braght, Thieleman J. van. The Bloody Theatre or Martyrs' Mirror of the Defenseless Christians Who Baptized Only upon Confession of Faith and Who Suffered and Died for the Testimony of Jesus Their Saviour . . . to the Year A.D. 1660. Scottdale, PA: Herald Press, 1951: 641. Available online at: http://www.homecomers.org/mirror/index.htm http://www.homecomers.org/mirror/index.htm. Génard, P. Antwerpsch archievenblad: IX, 7, 12; XIV, 28 f., No. 317. Zijpp, Nanne van der. "Maeyken de Hont (d. 1560)." Global Anabaptist Mennonite Encyclopedia Online. 1957. Web. 21 Apr 2019. http://gameo.org/index.php?title=Maeyken_de_Hont_(d._1560)&oldid=162624. Zijpp, Nanne van der. (1957). Maeyken de Hont (d. 1560). Global Anabaptist Mennonite Encyclopedia Online. Retrieved 21 April 2019, from http://gameo.org/index.php?title=Maeyken_de_Hont_(d._1560)&oldid=162624. This page was last modified on 15 December 2018, at 13:08.